My name is Jennifer Zeng, a writer living in New York. I have wanted to write to you ever since I received a shocking text message from my mother in China last month, before the 19th National Congress of the Chinese Communist Party. I was very much shocked why the Chinese authorities would have assumed that I would try to “come into contact” with you. However, I could see very clearly the mindset behind the warning: although you were invited to visit China as an “honorable” guest, and will be treated like one, many Communist Party officials still consciously and subconsciously regard you as an enemy. So even if they can invite and meet you, they absolutely don’t want me to do the same. They believe it is dangerous to them for an ordinary former Chinese citizen like me to meet you. I have been very frustrated that although I left China and have never been able to go back for 16 years, the CCP still keeps harassing my mother (and my father before he died in 2014) for things I have or have not done overseas. So I wrote an article to expose this. “Ever since Communism came into being, the free world has been battling it. In terms of people killed and the damage done to humankind, Communism has been the biggest disaster and continues to be the biggest threat. However, few people really know what lies behind it. “That was why Chiang Kai-shek lost his battle with the CCP and had to retreat to Taiwan; and that’s also why although we think that Communism is dead in many countries, it is still ‘grinding’ America and other countries down, disguised under other names. “For the first time ever, the “Nine Commentaries of Chinese Communist Party” published by The Epoch Times in 2004 offers us a very clear, thorough and comprehensive analysis of the nature of Communism, as well as the best solution as to how to deal with and disintegrate it. “As a result, up to now, more than 288 million Chinese people have published their declarations to quit the CCP and its related organizations. What the CCP fears most is for Chinese people and the world to see through it for what it is. “Ever since the publication of the “Nine Commentaries of Chinese Communist Party,” I have been tirelessly and proactively promoting it by writing articles, giving speeches, and spreading the message. 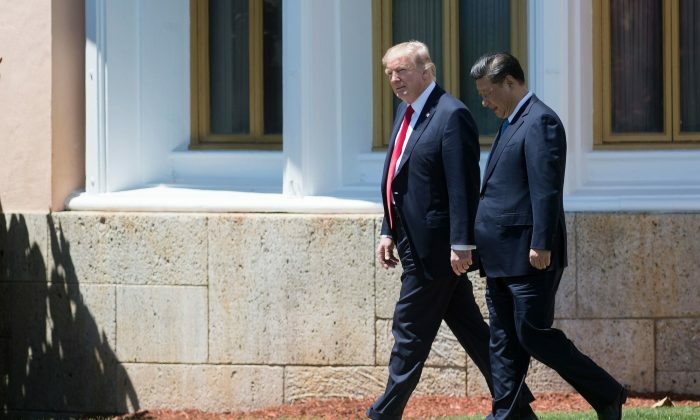 “If more and more people join in, especially if, as the leader of the free world, President Trump also realizes the evil and unchangeable nature of the Communist Party, recognizes the importance of the spiritual awakening of the Chinese people, and starts to support this cause, that will be something the CCP least wants to happen. I believe this is the main reason why the CCP doesn’t want me to try to get into contact with and express my thoughts to President Trump. “Another reason could be, as a survivor of the Chinese Labor Camp system, I have a very compelling and convincing story to tell. Almost every one who has read my memoir “Witnessing History: one woman’s fight for freedom and Falun Gong,” or who has watched “Free China: the courage to believe,” was convinced immediately of the cruelty of the persecution of Falun Gong; and some were so moved and angered that they wanted to take action to help. “The persecution of Falun Gong has lasted for more than 18 years. It has already become the largest scale human rights disaster and crime against humanity in this century. However, because of the tight media control, the world still knows very little about it. Your visit to China is obviously a very important one as the relationship between the United States and China is the most important bilateral relationship in the world today. If China can abandon the Communist ideology and system, can allow its people to have freedom to believe, to speak, to think, to gather and to associate, can respect human rights and universal values, and can become part of the civilized world, I believe both countries will enjoy peace and prosperity. However, if we still harbor rosy illusions that the CCP can be changed for the better; and that we just need to “engage” them and wait for good things to happen, the consequences could be disastrous, not only for China, but also for America and the world. So, if you have a chance, please encourage President Xi Jinping to consider abandoning Communism. It is not possible to achieve a “China Dream” while still embracing the Communist ideology and system. Communism has been proven to be the biggest disaster to human civilization, and has caused more than 80 million unnatural deaths in China. It is too late, and very unnecessary to try to save the party. Its crimes are beyond redemption. Another important point to make is that the persecution of Falun Gong has already become the biggest moral, economic, and social burden to China and the Chinese people. A “China Dream” is definitely impossible while still burdened with this unprecedented crime against humanity. Xi has a very good opportunity to redress this issue: since May 2015, more than 200,000 people, including myself, have filed criminal complaints with the Supreme People’s Court and the Supreme People’s Procuratorate of China against Jiang Zemin, who started the persecution in 1999 despite the opposition of other then-members of the Politburo Standing Committee of the Communist Party of China. This happened after Xi’s regime declared a policy to guarantee the registration and processing of all criminal and civil complaints. If Xi can utilize this opportunity to start investigating Jiang Zemin’s crimes; and eventually bring Jiang to justice, he will really be doing something very significant for China and for the world. Such huge crimes cannot be buried and ignored forever. If he loses this historic opportunity, how would he position himself in the history to come? Dear President Trump, if you could, I’d also like you to be reminded of the House Resolution 343 unanimously passed by the U.S. Congress to express concern over China’s organ procurement from non-consenting prisoners of conscience, including from “large numbers of Falun Gong practitioners and members of other religious and ethnic minority groups.” I hope you would express to President Xi Jinping how outrageous this crime is; and that it must stop NOW. Lastly, if you could, please also ask President Xi Jinping to ask authorities in Mianyang City, Sichuan Province to stop harassing my mother, an innocent 75-year-old retired judge, for anything I have or have not done in the United States. At this stage please allow me to give a little bit more information about my background. I escaped China in 2001 after being detained and tortured severely for one year in Beijing Female Labor Camp. The reason I was sent there was that the Chinese internet police had intercepted an email, a letter I wrote to my in-laws to explain why I did not want to give up Falun Gong even after the Chinese Communist Party (CCP) declared war against it. Please also allow me to say “thank you” for your hard work to “Make America Great Again.” I wish your Asian trip a great success!